So we're gonna take Ck's wunnerful idea & enlighten you bout us (assuming you wanna know) but first we have exciting news regarding the exciting OSCAR ("OS-KAT" Awards. 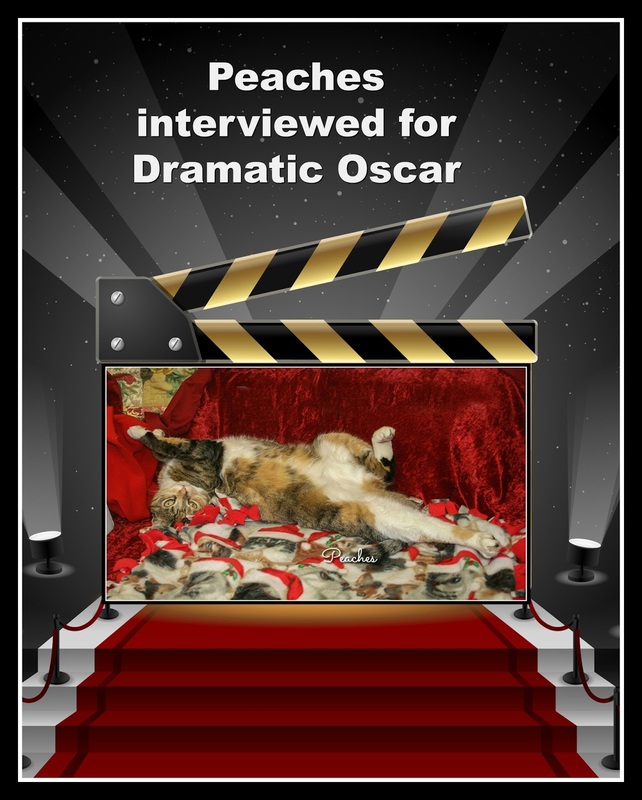 I, Peaches have been nominated for the "drama queen oscar" for my startling performance earlier this month. 2. 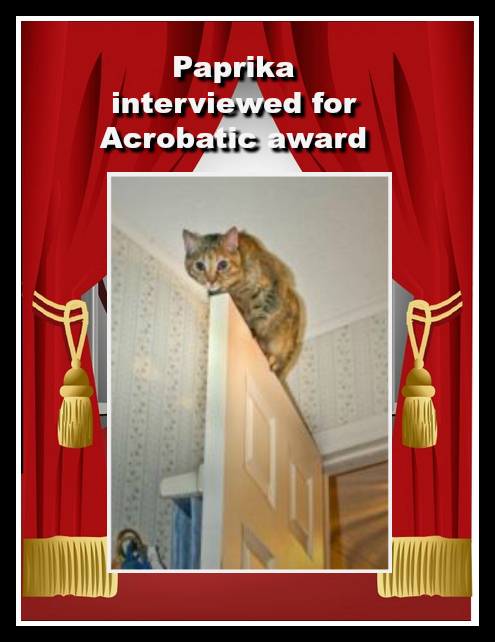 Paprika has been nominated for a special new category: the "Dramatic Acrobatic Cat" for her startling performance on DOORS. We will let you know tomorrow whether we won anything! Paprika: Salmon baking gently in the oven. Peaches: I never have to hiss. Everyone respects me already. Paprika: I hiss at Peaches a LOT combined with very SCARY musical snarly sound effects because she's always harassing me & I have to put on a show of strength. I never have hissed at humans, though. Peaches: Peach Blossoms of COURSE. And yesterday was "Peach Blossom" Day. Check out my post. Paprika: My mom's Silk Flowers. Crunch! Peaches: I don't do dogs. 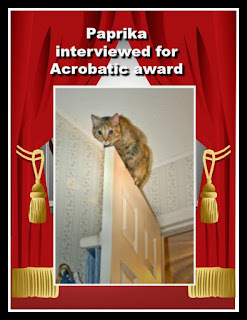 Paprika: We lived with a dachshund once. But he wouldn't let me ride on his back.Very uncooperative. Peaches: Peach Ice Cream Of COURSE. Did you know there is a special day to honor MY ice cream? 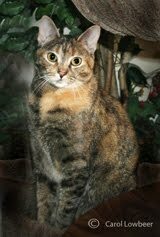 Paprika: When Peaches gets bossy & takes on an attitude (which is, like all the time). Peaches & Paprika: We like to go to sleep on Carol's jeans when available! Peaches: Dark Red w/wheels. I outgrew my Peach PTU. Paprika: Light blue with wheels. Peaches & Paprika: Anything we're told is "good" for us! Peaches: Halloween so I can Sceeeare people & wear fun costumes. like red horns. 16. Do You Have a Nickname? Paprika: "Paprika Ka-beeka!" I'm sometimes also called "Shrimpkin" cuz I'm small but I don't like that name. Peaches & Paprika: Country & Western-always! We were heartbroken not to get to go to Memphis when the Blogpaws convention was there. 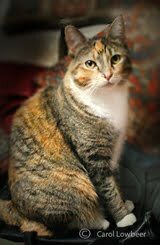 Peaches: I don't do tattoos but if I did, I'd have a logo that says "most beautiful cat" on it. Paprika: Peaches is totally nuts. Ignore her. If you got this far, thank you for reading about us, we really appreciate it. And to CK of Stunning Keisha for suggesting the fun questionnaire. 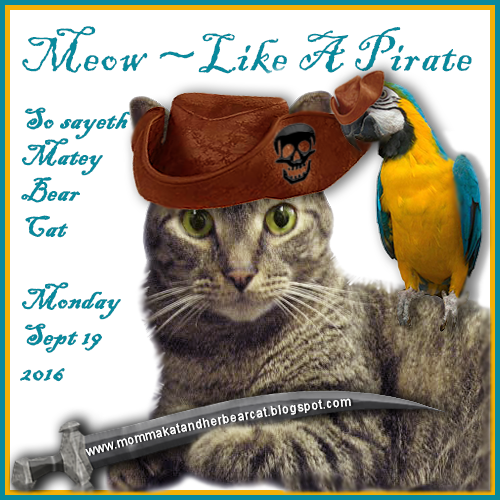 We're joining The Cat on My Head's Sunday blog hop & look forward to seeing you there! OH boy we are SO with you on 12. Good for us - no way am I eating' that stuff!!! MOL. Oh and conCATulations on your awards!!! Congratulations on the nominations, ladies very well done indeed. I think the high rise one takes some beating, do tell me how you managed to get down, or was the fire brigade called? Thank U fur your moral support. Our human is most unhappy with us re #12! Thank U fur your insightful comment. Well, getting down from those door-tops is always a challenge & not as easy as getting UP. . I scare the H___ out of my human when I look like I don't know how to get down. haha...loved learning more about you two. Hope you win, Peaches. Excellent answers! We really need to do that! What fun facts about you two. We got to learn more about you. Good luck on the Os-Kats. We think you're both winners. 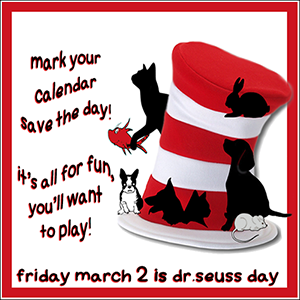 Thanks for playing along even though you are busy preparing your OS-KAT winning speeches. I learned lots about you ladies. Thank u for this info. is it ok if I email you with a few questions. I have your email!! Thanks!